MLSSA members engage in a variety of activities including diving and snorkelling, underwater photography, seminars for schools and community groups, maintenance of marine aquaria and study of the local marine environment. Our knowledge and educational resource materials are available to all. The History of the Marine Life Society Inc. The predecessor of MLSSA was the Marine Aquarium Research Institute of Australia (MARIA), and it was founded in Sydney in December 1969. By 1974 there were members in all states and many from overseas. 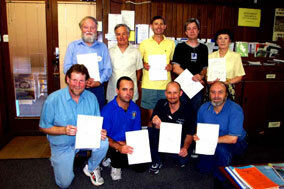 Branches had been set up in Adelaide, Melbourne, Woolongong, Newcastle and Cairns. Membership of the Institute gradually dwindled and branches closed. By 1982 the only branch left was in Adelaide and the decision was made to close and re-open with a new name, constitution and aims. September 15th 1982 marked the final meeting of MARIA (SA) and the present Society was born. The following is list of original members of MARIA. I. Bonnes, K. Bowden, G. Brown, T. Considine, B. Douglas, M. Drechler, H. Duyverman, W. Farquhar, Dr J. Glover, A. & P. Hale, The Heide family, P. Henderson, T. Isaacson, B. & P. Jay, K. Lang, T. Lloyd, P. Lynch, P. Lunn, The Martin family, R. McLaughlin, D. Pollock, H. Rapp, Dr B. G. Schultz, J. Snelgrove, G. Storr, A. Udina.